There aren’t many cars on the road that I don’t recognize, but this one totally caught me by surprise at Cars and Coffee. I confess that I don’t know much about mid-century French cars, so I hope you will forgive me for not recognizing this one right away. However, I thought it intriguing enough to take some pictures – and boy, am I glad I did! 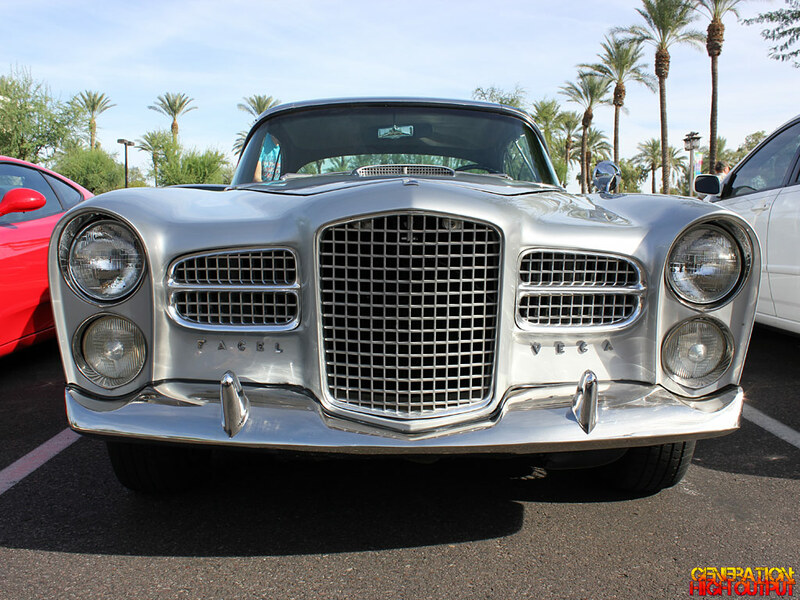 As it turns out, this gleaming silver beauty is a Facel Vega HK500. One article I read called it “The best car you’ve never heard of” and after doing some research, I can see why the author made that statement. Facel was a French company that unfortunately didn’t last very long. Between 1954 and 1964, they produced about 2,900 cars altogether. Facels were known for their luxury, speed, and style. They were hand-built and show exquisite craftsmanship. Their most well-produced model was the Vega, which borrowed its name from the celestial star. 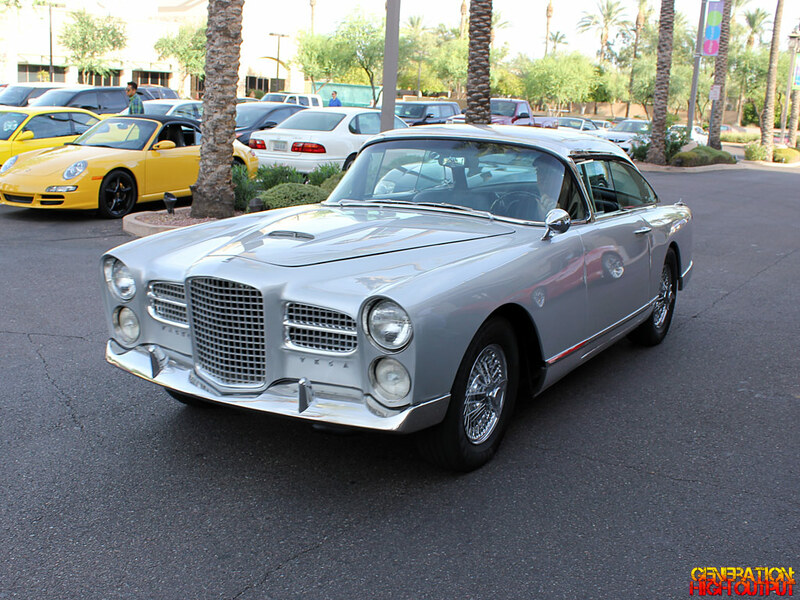 Only about 540 Facel Vegas were ever made, which makes this an exceptionally rare car to see in the wild (and a left-hand drive one at that!). On the outside, the Vega HK500 looks like a stately gentleman’s car. Though it was larger and heavier than a sporty Aston Martin or Jaguar from the same era, it looks every bit as fancy as those other European cars. I particularly like the way the exhaust exits through the rear bumper. What really makes this car special is its engine. The HK500 came equipped with a 392 cubic inch (6.2-liter) Chrysler HEMI V8 under the hood that packs 360 horsepower and 400 ft-lbs of torque! Sacré bleu! Paired with the Chrysler engine was a Torqueflite push-button 3-speed automatic transmission. A 4-speed manual was a rare option, which this car does not have. These were also the first French cars (and among the first in the world) to have 4-wheel disc brakes as standard equipment starting in 1960. According to what I read, this was the fastest four-seater car in the world at the time. Thanks to that big Chrysler V8, the car could do 0-60 mph in just 8.5 seconds with a top speed of 140 mph. That’s pretty darn impressive for the late 1950s! The Vega was also very pricey – they started around $7,500 for a base model and about $9,795 for an HK500 in 1958. That’s equivalent to $76,700 in today’s dollars. There was more to the Vega than just style and power, it also had luxury. 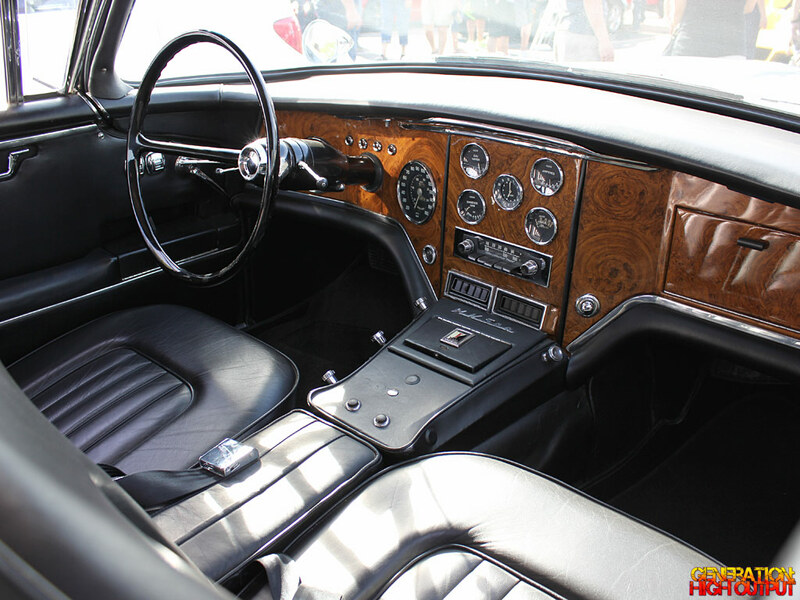 Check out the beautiful woodgrain dashboard with lots of tastefully trimmed gauges. It’s no wonder these cars became popular with Hollywood celebrities. Notable owners included Pablo Picasso, Ava Gardner, Christian Dior, Joan Collins, Ringo Starr, Max Factor Jr, Joan Fontaine, Tony Curtis, several Saudi princes, Dean Martin, Fred Astaire, Danny Kaye, Louis Malle, The President of Mexico, François Truffaut, Robert Wagner, Anthony Quinn, Hassan ll King of Morocco, Debbie Reynolds, The Shah of Persia, Frank Sinatra, Maurice Trintignant, Brian Rix and French Embassies around the world. Wow! Even racing legend Sir Stirling Moss owned one of these cars. So by now you must be wondering what happened to Facel. Though the Vega was a hit, their follow up car (the Facellia) was not. Financial troubles caused Facel to close for good in 1964. The Vega is the third American V8-powered European car I’ve seen at Cars and Coffee! Previously, I covered the Shelby-powered Sunbeam Tiger and the Chevrolet LS1-powered Citroen DS, although the latter was an engine swap and didn’t come that way. I’ll definitely be keeping my eyes peeled for more awesome cars like these in the future! 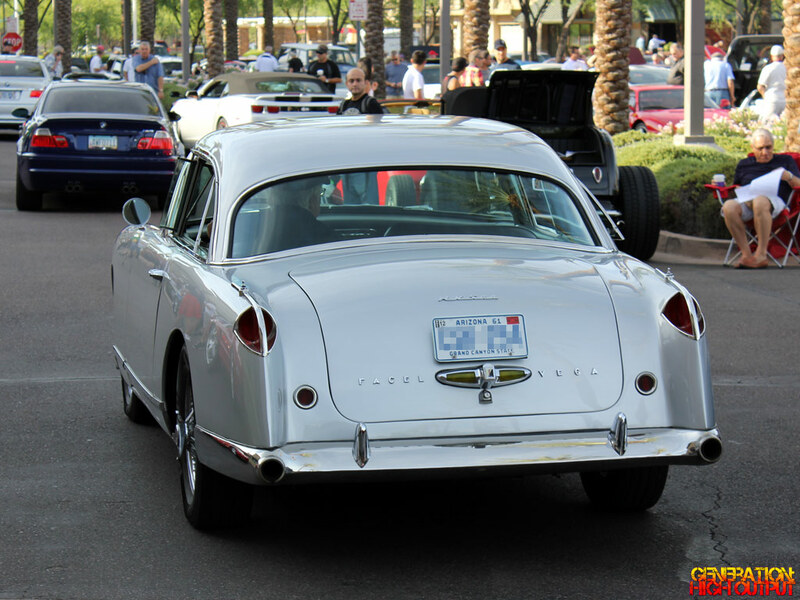 This entry was posted in Cars and Coffee, Not Sold Here and tagged cars and coffee, classic car, Facel, French car, HK500, import, luxury car, rare, That Thing Got a Hemi, Vega by Trevor Freeman. Bookmark the permalink.